Welcome to BeadSale.com! Thank you for choosing us as your source for Mardi Gras Supplies. Click on the product category at the left you would like to browse. When the product images appear, click on any product name for a larger picture and a full description. Click on "add to cart" next to any item you would like to order. When you are finished with your order, click on the green "CHECKOUT" button at the top right of your screeen. Your shipping charges will be calculated during the checkout process. Our online servers use the best available security to ensure your credit card is safe. However, if you would prefer to place an order by phone, feel free to contact us during business hours at our toll-free telephone number: 1-866-895-3818. As always, we appreciate your business and will quickly answer all questions and concerns we receive. If you are visiting our site outside of regular business hours, drop us an e-mail, and we'll happily answer any question you have as soon as we return. We strive to provide the fastest and friendliest service in our industry. Read our customer testimonials here. 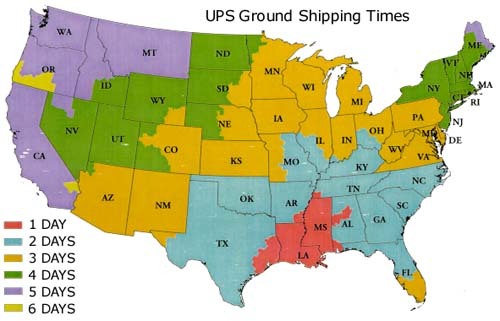 To determine which shipping option you should select, view the UPS Time in Transit map from our Baton Rouge, LA warehouse. If your order is placed before 2PM Central Time on a weekday, it should go out the same day. UPS Next Day Air, 2nd Day Air and 3 Day Select are available.